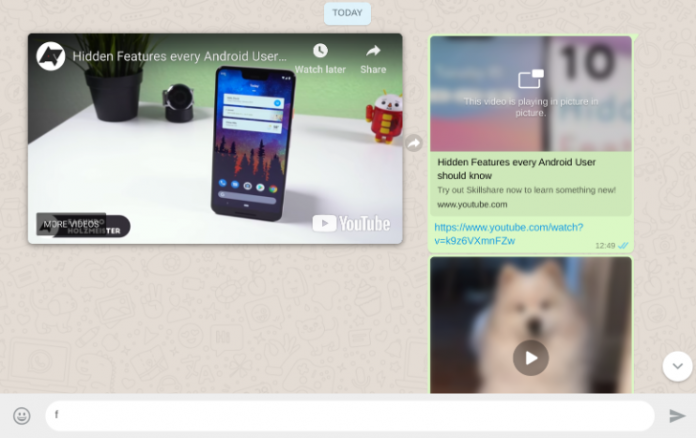 WhatsApp Web is getting a new picture in picture mode, which has already been rolled out earlier in part for video recorded, shared from user’s media library. According to WABeta Info which is known for accurate information about upcoming features on WhatsApp, the new version 0.3.2041 brings the WhatsApp Web Picture-in-Picture or PiP mode, also known as PiP to videos which are from other platforms like YouTube, Facebook, Instagram and Streamable. The report also notes that users can test the feature by sending a message with the video link from one of these websites. A preview of the video will show in the bubble and the pressing it will give the Picture-in-Picture mode option. Clearing cache could help ensure that the feature works. The new feature also gives the option of switching chats without closing the PiP mode, which means video you were watching will continue playing, while you switch chats. In the WhatsApp Web picture in picture mode, the video pops out and begins to play out. Users have the option of going back or forwarding or putting the video on pause in this mode. The WhatsApp Web Picture-in-Picture mode also lets users watch a video on mute. To use the WhatsApp Web picture-in-picture feature, you can send a message with a YouTube link or any video platform link. The receiver will get the link with the preview which will mean that if the user taps on the link, the video will start playing. Once the user changes the chat, the video will continue to play in a bubble. Users will be able to close the video playing in PIP mode by a swipe gesture. The WABetainfo further adds that users can clear the cache of their browsers in case the feature doesn’t work even after installing the latest 0.3.2041 update of WhatsApp Web.